Do you love the Junction? Do you love to write? Join me for a *free* 8-week writing workshop at the Annette Street Library where we will find our creative voices, inspired by the Junction. Please register for the free workshops in person or by calling Annette Street Library at 416-393-7692. Writing the City is a writing-based community engagement project based on The Love Lettering Project, the internationally acclaimed writing project founded in 2004 by Lindsay Zier-Vogel. After a successful 2017 season at Parkdale Library, Writing the City will take place at the Toronto Public Library’s Annette Street branch, and be comprised of a registration-required eight-week writing workshop for adults. In the workshops, participants will generate poetry and short fiction inspired by and/or situated in The Junction and to conclude, we will be hosting and optional public reading for the community. Participants will uncover their own voices and Lindsay will work with the writers in providing community-focused inspiration and editing skills, transforming their work over the course of the 8-week workshop. Lindsay is an active member of the community-based arts community and since 2004, she has been asking people to write love poems to their communities, slip them into airmail envelopes marked “love.” and distribute them anonymously throughout their communities. 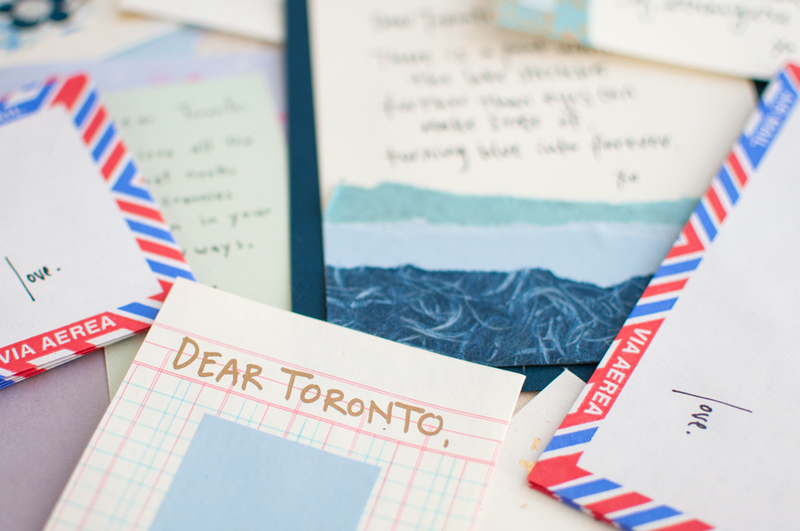 Through her Love Lettering Project, thousands of people have participated in over 50 events in Toronto and in two Canada Council-funded tours to the UK and Canada’s North. The project has the capacity to transform an individual’s relationship to public space and their communities through social and artistic engagement. Since its inception, Lindsay has developed a co-creative writing workshop program based on these principles, uniting creative writing and community engagement in workshops for children, youth and adults (through the TDSB, Pathways to Education, Big Brothers Big Sisters Canada’s DreamCatcher Mentoring, Sister Writes, among others). Lindsay received an M.A. in Creative Writing at the University of Toronto under the advisorship of award winning novelist, Anne Michaels and has been published in many publications including The Toronto Star, The Lampeter Review, Taddle Creek, room of one’s own, Where The Nights Are Twice As Long: Love Letters of Canadian Poets, published by Goose Lane Editions and Watermarks: Writing by Lido Lovers and Wild Swimmers. More about Lindsay here. Funded by the Ontario Arts Council’s Community Art program.